I did not catch the actual liberation of Italy from the Nazis and Fascists in World War II on video, admittedly. But yesterday, on 25 April, the 69th anniversary of that event was commemorated. Of course Italy was not liberated in one day. The allied troops landed on Sicily on 10 July 1943 and it took them almost two more years to complete their campaign to liberate the rest of Italy, moving northward slowly and under heavy losses. 25 April was chosen as a public holiday because the cities of Milan and Turin in northern Italy were liberated on 25 April 1945. 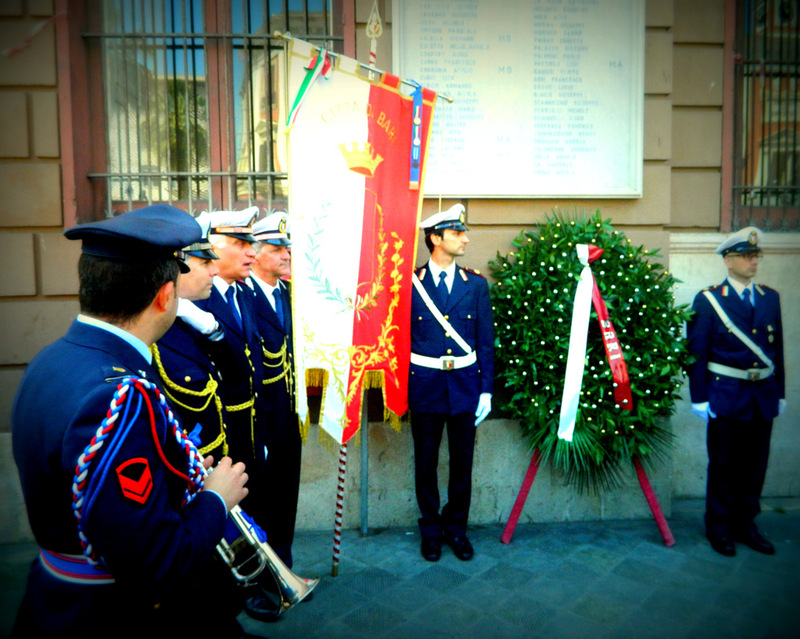 I attended the official ceremony in Bari, where a wreath was dedicated to the killed partisans. The more you read about the partisans, the more you realize that they would deserve much more creativity to be applied in their commemoration that the same wreath with a ribbon every year. There were only a few dozen people, half of them soldiers and reporters, who probably didn’t have any other choice. A “Committee for the Defense and the Implementation of the Italian Constitution” handed out leaflets with complicated flow-charts about the reform of the election law. But then it did turn solemn. Michele Emiliano, the mayor of Bari, intoned the partisans’ anthem Bella Ciao and the small crowd sang the melancholic but beautiful song. Good thing to have a mayor who can sing. The soldiers however were less inclined to take part in the singing of a song that appreciates partisans fighting outside of a regular military force. Walking home, I was wondering once more why there were fighting resistance groups against the Nazis almost everywhere in Europe, but none in Germany. This entry was posted in Apulia, Films, History, Italy, Military, Music, Travel, Video Blog, World War II and tagged Bari. Bookmark the permalink. I don’t think this is entirely correct – there have been numerous assassination attempts against Hitler by Germans – unfortunately none of them succeeded. Also, there were other resistance groups, for instance Hans and Sophie Scholl in Munich, as well as others. I think the problem in Germany in the 30s and 40s that the environment was so oppressive that you could trust virtually nobody, because a wrong word out of place could have had disastrous consequences. Yes, of course there was some resistance, but there was nothing as large-scale and effective as the partisans in other countries. Maybe the “Edelweißpiraten” tried to do something like that, but again it’s embarrassing that it was left to teenagers. I guess you are right about the level of mistrust and oppression. It comes to light very well in Hans Fallada’s novel “Alone in Berlin”, written immediately after the end of the Nazi era. But then that same level of danger existed in all the other parts of Europe that were occupied by Germany. Yet, there thousands joined the partisans to actively fight the Nazis or their own Fascist governments. As the Italian partisans show, it cannot simply be a matter of seeing the Nazis as a foreign occupying power because they were fighting the Italian Fascists as well. To me, the absence of any large-scale organised resistance confirms that most Germans were quite happy with the Nazis, at least until World War II turned bad for them, around halfway through the war. All these officers around Stauffenberg for example only became opponents of Hitler once they noticed that Germany would lose the war. As long as there was any chance of conquering and dominating all of Europe, they were happily on board. My family felt the sting of fascism for years and were in active resistence before the Germans ever turned up. As far as they were concerned the Germans were new friends of Mussolini and his Black Shirt enforcers who had been robbing them for years. Maybe It had to take something like Germany’s over extended war to rid Italy of direct fascist control. I think that’s giving too much credit to Germany. In the end, it took – like so often – Americans, British and Commonwealth soldiers.